After Russia showcased its most advanced fighter in France, the Western media agreed that the newest Russian Su-35S fighter proved that Sukhoi-made fighters are among the best in the world. Western media called the demonstration flights of the newest Russian Su-35S fighter at the Paris Air Show 2013 the high point of the event. Making its foreign debut, the new combat machine wowed the public with a series of aerobatic maneuvers that no other aircraft can perform — proving yet again that Sukhoi-made fighters are among the best in the world. The Sukhoi Su-35 is modestly categorized as a 4G++ fighter, whereas the real 5G fighter — the Prospective Airborne Complex of Frontline Aviation (PAK FA) T-50 that was developed as a response to the United States’ F-22 Raptor — is still undergoing tests. The T-50 made its maiden flight in 2009, and full-scale production is expected to start in 2015. Until then, the Su-35 will remain the interim stage at which military pilots master the new generation technologies. The term “interim,” however, does not seem to suit the new fighter very well. The ultra-maneuverability of the Su-30MKI (a predecessor of the Su-35) is fully enjoyed by Indian pilots during joint exercise with air forces of foreign countries. The Indians piloting Russian fighters had a decisive victory in mock combat against the United States’ F-15C/D in a U.S.–India joint exercise a little while back. The “Russians” proved to be better at maneuvering and detecting the “Americans,” and were thus able to hit the target first. Gen. Hal Hornburg, chief of Air Combat Command, called the exercise “a wake-up call” for the U.S. Air Force. “We may not be as far ahead of the rest of the world as we thought we were. The Russian Su-30MKI fighters are better than the F-15C — the U.S. Air Force’s primary air superiority aircraft. The air forces of the countries whose inventories include these machines have a certain advantage and, in the future, may present a threat to American air superiority,” USA Today quoted Hornburg as saying. This makes the machine not only faster and more maneuverable, but it also enables the aircraft to carry more weaponry. This engine — also known as the “first stage” engine — will be installed in the first production models of the T-50 fighter. The “second stage” engine, which brings the T-50 even closer to the United States’ F-22 Raptor, is still under development. 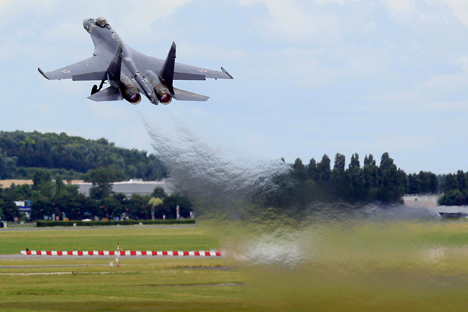 However, Marchukov said at Le Bourget that the new engine is almost ready. Sukhoi test pilot Sergei Bogdan said that a Su-30MK fighter escorted the new Su-35 when it performed its first flight, for the purpose of comparing the thrust characteristics of the two fighters. The Su-35 markedly outperformed its predecessor. According to the pilot, this advantage of the new model offers the pilot an edge over other fighters during air combat. The Su-35 has a 5G generation cockpit with no analog devices, unlike the Su-27. The new fighter has two large LCD screens displaying necessary data, the way a regular TV operates in the Picture-in-Picture mode. Similar to flight simulator games, the pilot can choose the 3-D display mode for the terrain relief and location of targets. Some of the information can be transmitted into the pilot’s headpiece, as well. The hydrodynamic control drives have been replaced with electrical ones. According to the designers, this will enable “parallel,” or remote, control of the machine. This implies that the role of the pilot will be further reduced. In other words, the computer will determine the best speed and mode to engage the target, as well as the best time for the pilot to use the weapons. The pilot will not be allowed to make a single mistake — the computer will disable manual controls and show the pilot what is wrong. The machine is capable of working in some sophisticated flight modes independently of the pilot, in addition to continuously monitoring his health status. If the pilot is unable to control the machine for some reason, the plane will automatically eject him. The Su-35S is the first fighter equipped with the latest SINS navigation system — an electronic and mechanical device that no contemporary fighter can do without. The system collects and analyzes flight information and helps the pilot take the plane back to the home airfield. The SINS system is coupled with GPS and GLONASS receivers, but it is also capable of working on its own. Furthermore, the fighter is equipped with a perspective radar complex designed for the T-50. The F-22 is the only other fighter equipped with a similar radar system. The radar detects targets at a distance of several hundred kilometers, tracks up to 30 targets, and aims the fighter’s weapons at up to 10 of them. The aircraft’s designers claim the Su-35 can engage 10 targets at once by firing a series of rockets. Russia lags behind the United States in developing its 5G fighter. The F-22 was adopted by the U.S. Air Force long ago. It is the previous-generation 4G++ Su-35 fighter; however, this shows how perfect the upcoming T-50 will be. It is for this reason that it was so important for Moscow to showcase the Su-35 at the Paris Air Show. The Le Bourget success includes the political component of the military and technical rivalry with Washington, as well as the purely economic effect. Like the F-22, the T-50 will not be exported. A Raptor is worth $133.1 million; the Russian T-50, while cheaper, will also cost a pretty penny. However, the Su-35 will cost about $30-38 million (the same as its 4G predecessors), which makes it an excellent export item with a “5G minus” label. Moscow is mostly eying its traditional buyers from China, India, Malaysia and Algeria; however, the effectiveness of the new machine will enable the Russian producer to compete for the Brazilian and South Korean markets as well. The Su-35 clearly stands among all 4G+ European fighters, such as the Rafale and the Eurofighter-2000, as well as the modernized American F-15, F-16 and F-18. It is even capable of effectively competing with 5G F-35 and F-22 fighters. In any case, the Su-35 is the latest and most advanced fighter of the previous generation of aircraft engineering.